On our most recent holiday in South America, Natalya and I were completely wowed by the cuisine of Chile. Chilean cuisine and cooking techniques are quite simplistic but what defines Chilean cuisine to me is the ultimate freshness of the produce. I felt that every fruit and vegetable I tasted in Chile was by far the best I had ever tasted. Every tomato was of perfect ripeness, every onion had that perfect crunch with a hint of sweetness, and every pepper was a bit of a fire-starter. 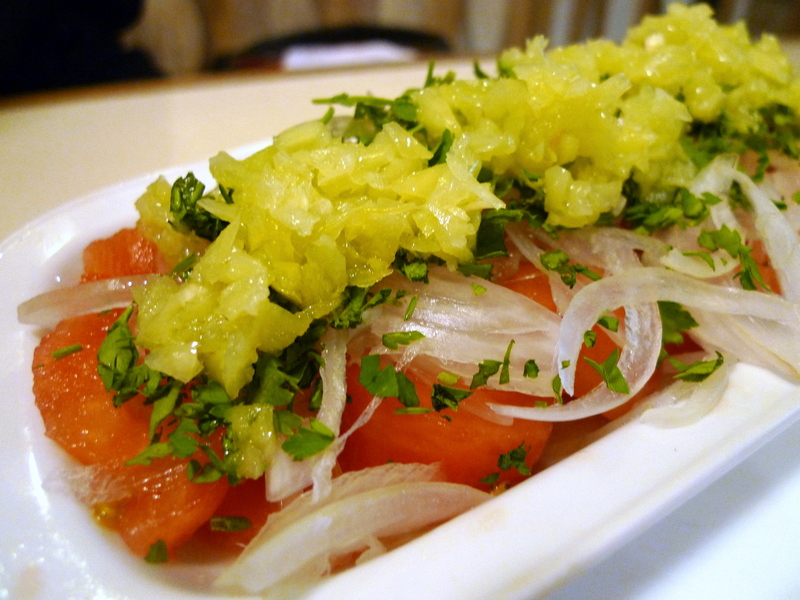 Ensalada Chilena is a very popular salad that is served everywhere in Chile. To me, this dish embodies Chilean cuisine — simplistic preparation of deliciously fresh vegetables. I found it interesting that Chileans always peel their tomatoes; I never found a skin-on tomato served anywhere in Chile. When dealing with raw onions, another common Chilean technique is to temper the onions with salt or sugar to take away the sharp pungency (and reduce the possibility of heartburn according to Chef Boris’ Mother of our Chilean Cuisine Cooking Class). After chopping the onion, place it in a colander and put it under warm water with two tablespoons of sugar. Squeeze out the excess juice from the onion and strain. This process helps to reduce the pungent smell and the possibility of heart burn, according to Chef Boris’ Mother. 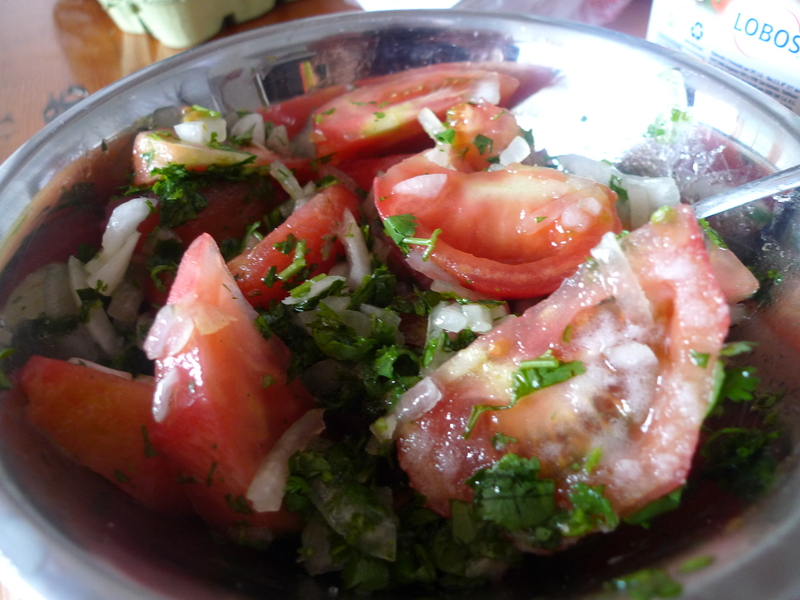 In a bowl put the sliced tomatoes, washed onion and chopped coriander. Add olive oil and mix well. Add salt and pepper to taste. Sprinkle with chopped cilantro and serve. Optional: add some finely chopped chile peppers to add a bit more kick! Another gereat recipe from your trip.